Not a cloud in the sky for the final day of racing in the 2014 edition of Thanksgiving All-Star Classic. A weekend plagued with temperatures barely breaking 50 degrees we were certainly in for a warm up. We were literally and figuratively in for a warm-up, by 9am temperatures were already in the mid 50s with a forecast of 64 degrees for the drop of the green flag. All the practice was complete, drivers put in their best lap for time trials and played the chest game that we call heat races. Today was the day to ‘Put up or shut up’ as they say. A feature that had normally been part of the Saturday program at The Park got their own time to shine after owners Jerry Brown & Mike Diaz decided to move the Late Model program to their own date. Nineteen limited’s packed their haulers and headed to Kenly, North Carolina for a chance at $4,000 and the opportunity to put their name in the Thanksgiving All-Star Classic history book. Tony Grady – yes the same Tony Grady that went for an unexpected ride through the catch fence just a few weeks ago – was the man to beat for most of the weekend. Kind of ironic that he was close to packing things up and heading home stating the car was so bad Friday during the test. Granted, isn’t that what just about all these drivers say when the car is –quote, unquote – bad? Hats off to the entire crew for figuring things out because Grady was bad fast all day Saturday, in fact, the only car to post a time in the 15.6 second window. He would also go on to win his heat race, locking up the Sellers Racing Pole Award. It did not take long for the field to settle down and hit the cruise control button and start rolling through laps. Tony Grady dove into turn one secured his position at the lead of the pack while his son Andrew Grady slithered on up to the second spot forcing Rusty Daniels to deal with the third place position. 15 – 19 – 19 should have been the Pick 3 numbers to play as it only took 15 laps for Grady to put the #19 of Adam Congrove a lap down – the first of 19 cars to lose a lap to the leader. One car who I personally did not expect to see fall a lap down was that of 2014 SNMP track champion Haley Moody. Not but twenty laps in she had already started making her conservative move towards the front when her car lost power, plenty of track position, and a lap to the leader. No caution flag would wave as the car came back to life by turn one but the damage had already been done. By damage I don’t mean cosmetic or mechanical, I mean all her hard work from the drop of the green flag seemed for nothing. We later learned as Moody went to hit the switch for her fan she must have hit the ignition switch also and cut all life to the power plant. We did not see our first caution until lap 75 – well let’s go ahead and say 76 as because it took that long for all the cars to pass the scoring line before race control could throw the yellow and not jack anything up. Halftime for the limited much like of any 200 lap LMSC race – pace car brings the field down pit road, 10 minute work session when all cars have stopped, normal pit stop adjustments only, able to change right side tires if you would like. Most teams that I saw took that offer pretty easy, as well as make some minor adjustments to counter act the shade stretching from the entry of turn one to about midway down the backstretch. You know that other saying in racing, Cautions breed cautions, well I guess that stigma doesn’t discriminate against competition cautions either. As the field stampeded into one not sure if Daniels had help, got a little to high or not enough heat in those right sides but he went for a spin up the banking to bring out the second caution of the day. Unable to rejoin the field where he left it, Daniels brought his ride to the attention of his crew for a good look over the car to insure nothing was wrong. After the field got back to green flag racing we finally had a battle for the lead. Clay Jones started to take a bit of a higher entry into the corners. He was only able to get to the rear bumper of the 4 car a few times but would eventually slip into the grasp of Andrew Grady. It’s not like I’m saying Jones lost a lot of ground because the top three hooked up nose to tail and started to roll. Until ANOTHER yellow flag brought out by the #9 machine of Charles Watson & Robert Bruce made contact out of turn two. Haley Moody stood to gain the most for this caution period, she was the free pass car and would restart on the lead lap. With only 50 laps remaining and plenty of fluid on the track, race director Juston Ellis, decided to put the field under the red flag so the fans would not get robbed of a good show. Once clean up was complete the order to place the cone was given and take a guess who was the first taker… Andrew Grady himself. Father-son front row coming to the green flag but Clay Jones had better ideas and tried to pull a cross move. As epic as it was, Jones was not able to hold onto it and Grady would remain your second place car. Meanwhile Chris Chapman decided it was time to make something happen, he tried dive bombing Throckmorton but couldn’t make it stick, his car would go for a ride and bringing out yet another yellow flag. Again out came the infamous orange cone but this time Andre Grady leaves the temptation behind, cannot say the same for Jones. The green flag was displayed again and the hunt for the race lead was on! Grady and Jones spent the entire lap door to door with plenty of contact to boot, Jones able to hold on more this time and we had a new leader as of lap 118. All that racing must have gotten to exciting for McGee & Phillips as they made contact bringing out yet another yellow flag. After clean up was complete and the cars removed from the racing surface we were able to get back to green flag racing. With laps ticking down drivers were cracking the whip, so much in fact we were three wide out of two. Daniels, Glenski, and Throckmorton make things work a bit with Throckmorton getting the raw end of the deal forcing him to backwards. Looking back up front, the top four now nose to tail with only 20 laps left in the race. Clay Jones knew the pressure was on because he started trying every line in the book to drive under or above the four car but just could not make it stick. All the while Rusty Daniels riding in the catbird seat waiting for the Grady’s and Jones to slip up and take home the win. Though a good idea at the time he did not have enough car to make any moves, however, Andrew Grady had other plans for the Clay Jones machine as the field took the white flag. Andrew dove the car deep into one hoping to make it stick, it did and he was able to drive away to a second place finish. Clay Jones, Rusty Daniels, Joey Throckmorton finished out the top five. 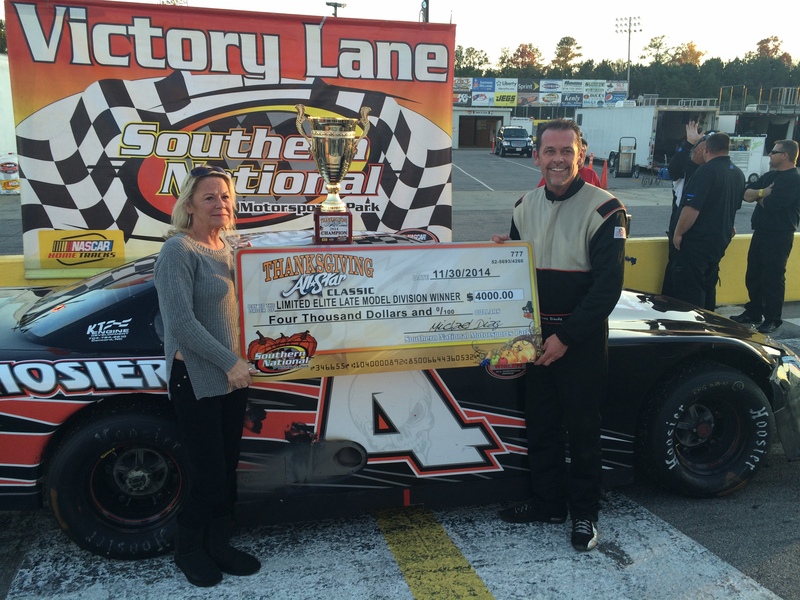 Chris Johnson made it two in a row at Southern National in the 2014 edition of the Thanksgiving All-Star Classic. Johnson took the lead away from Humblet in the almost caution free feature on lap 33 and immediately put two cars between the two. Early, it looked like Jimmy Humblet was going to be the car to beat, when the green flag was displayed Humblet hit the gas and the nitrous button at the same time. Not but five laps in Humblet had built himself all but a full straightaway lead over Johnson, you had to look back another eight cars to find third place Shawn Balluzzo. I really wish there was something more interesting to talk about this race but there really wasn’t. Only other interesting thing I learned after the fact was the #77 of Hunter Slayton showed up with his huge motor pretty much to shake things down for the Snowball Derby next weekend – he would pull his machine off at half way and leave it up to everyone else. The nights one and only caution came from the solo, untouched, random spin of none other than Chris Humblet. Which, has earned him last nights “D’oh Moment of the Race Award” – honestly I am pretty sure this puts him at the top of the list for the entire weekend! By this time in the race all but the top three were the only ones left on the lead lap leaving Humblet & Balluzzo the only ones eligible for the cone, no one took the bait creating a single file, green-white-checkered. Nineteen cars were in attendance this weekend at The Park for their 40 lap feature. Yes, you read that right – no that was not a typo. 19 legend cars packed the infield of Southern National, probably… no definitely the most INEX Legend cars I have seen on a single track in over three years. Pretty obvious these drivers were just as excited to get things started as we were as it took two times to get a good start from the flag man. Pole sitter Billy Hall was first to jump on it to soon causing a complete restart, then outside pole sitter Justin Carroll was found guilty of jumping on it to fast. ’Third times a charm,’ is a true statement! Finally working some green flag laps it was clear to see that Carroll in fact had the better car on restarts as well as the faster car on the longer runs. Things got single file pretty quickly as the triplet of leaders checked leaving all of a ten car gap between them and Tommy Jackson, Jr. Besides the couple of intentional cautions brought out by a couple of guys that I will just leave their names out of the conversation, it was a relatively easy-going race. Have to give credit to Tommy Jackson, Jr for running down Billy Hall with 15 laps to go and creating some pretty interesting racing. Jackson & Hall would spend the rest of the race battle and exchanging the third place position, however, Hall would prevail to hang onto the third spot. Alex Pacheco, in the #77 car almost made things interesting running down Justin Carroll but was not able to make a clean pass for the lead, even after a green-white-checkered and would have to settle for second place. “I was so disappointed there,” Carroll said about that late race caution. 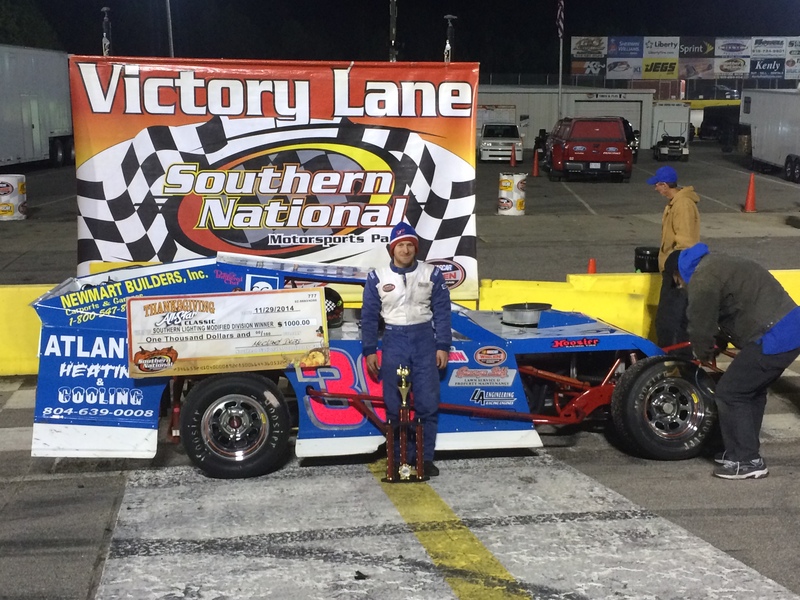 “The car wasn’t quite handling there in qualifying for us, we left a little bit out there but made some good adjustments for the race there.” Carroll also had this to say about his first two races/wins at Southern National. “This car was just hooked up all weekend. Being the first time here at the track and winning back to back races I can’t be more proud. I just want to thank Stephen Ross for letting me drive his car,” Carroll also had to say before heading to tech. “And being able to do burnout out there, it was the first time I have done those in my life.” Alex Pacheco would hold onto second, Billy Hall third, Tommy Jackson fourth with Dillion Spain rounding out the top five. A cold night to say the least down in North Carolina to kick off the annual Thanksgiving All-Star Classic at Southern National Motorsports Park. While some were up bright and early to stand in line and fight for their right to buy the $300 TV, others were packing up race car trailers and heading to North Carolina for some racing. What happened next was completely unexpected, Gary Ledbetter had to pull his machine down to the attention of his crew, we learned later in victory lane that he had a right rear tire going down. This allowed Jesse Council to take over second position on the restart. Out came the cone – which if you are not familiar officials place a cone in the middle of the speedway allowing drivers to choice the low or high side on the restart – and Council saw his shot at the lead. As the green flag was displayed Council got an incredible jump and the lead was his out of turn two. Council was not able to keep the car on the bottom and washed up to the top side where he was freight trained back to the fourth spot. “Once these tires go through a heat cycle man the car just wants to push like a bulldozer,” Council said during post race tech. The restart had also helped Ledbetter catch back up to everyone and start making his moves back to the front of the field. In fact Ledbetter had passed Ganoe, and moved by Barnett to regain the lead with just ten laps to go. It looked like it was going to be smooth sailing for Ledbetter in this one until we meet the infamous debris caution. Clean up crews attended to turn two for whatever reason, bunching the field back up for a three lap shoot out. Oh but wait, whats one of the famous sayings in racing… cautions breed cautions, and so it did. On the ensuing restart, while the field dove into three Mike Ganoe had something expire and a HUGE plume of smoke came bellowing out from under that car sending him spinning into the outside wall ending his night. 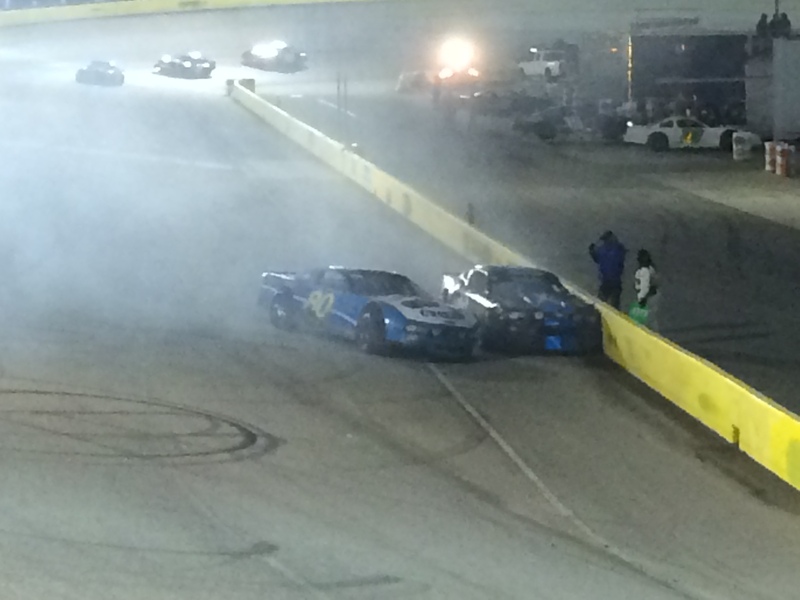 Barnett had a much better go this time around and was able to stay to Ledbetter’s door till the exit of turn two. It was like the 32 machine hit the nitrous button driving off two and he was gone. The battle was then on for the third spot between Council and Maready for the final two laps. The only battle on the track as the race came to an end saw an almost photo finish with Maready edging Council for third by just a bumper. cover. 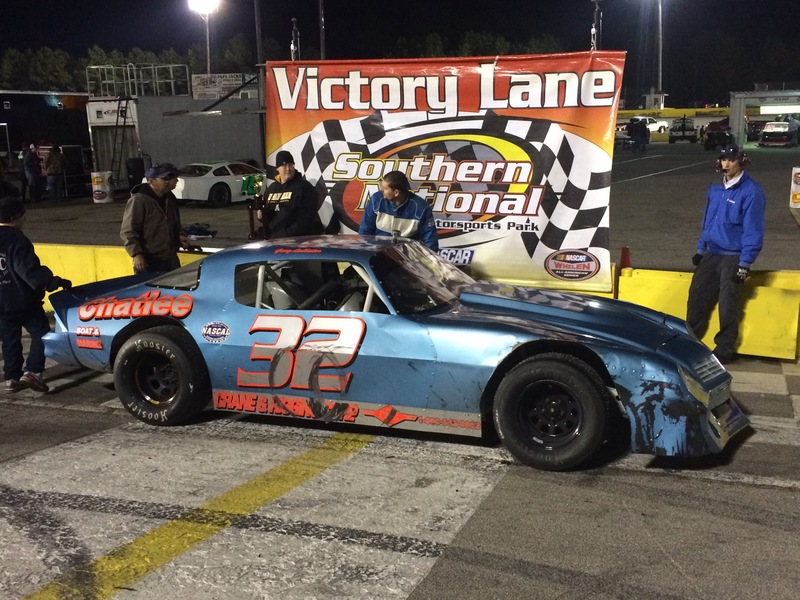 “We had a right rear tire going down,” Ledbetter said in victory lane. “We came in and changed it and it made all the difference in the world.” He went on to think his crew and all the fans who came out to sit in the cold to watch the race. Racing continues later this evening with Limited Late Model & IMCA style modified qualifying at 1:45 pm, with heat races and a 50 lap feature starting around 5pm.